I'm looking for a boat to troll Lake Ontario that will comfortably accommodate sleeping at least 4. Plan to spend weekends on the boat with slip in Sodus and make trips to other ports on the lake with family and friends. The boat MUST be a fishing boat first! I will spend more time trolling than leisure time on the boat. Must be able to have 2-3 down riggers and other rod holders. My wife and two daughters are keen to have a decent cabin to sleep and hang out in. I'm trying to stay in the neighborhood of $25k. Maybe more for the perfect fit. I'm looking at boats anywhere from 25-33'. I'm reasonably new to NY as I moved from Minnesota a couple years ago so getting into a boat this big is new to me and I'm beginning to understand the combination fishing/cruiser I'm looking for is not very common. Also interested in hearing from LOU members where to go for tips/assistance outfitting a boat if I end up with a boat that I need to add all the fishing gear to. I'm pretty handy, but want to ensure I do it all right the first time and would pay for certain things to be done. the Sea Ray Sundancer. Built in many lengths in your range and built for many years so there are always some for sale. If you want something that will sleep 4 comfortably - will need to look larger than 25'. We have a Tiara 3300 that will sleep 4 and is a great fishing boat. In your price range for a bigger boat you will probably be looking at something older and will need to figure in maintenance costs. Thanks, lakebound88. I've looked at that boat online and Sea Ray 330 Express Cruisers that are similar. With this stupid weather I may not be in a hurry so plenty time to look at options. Though I was out with my girls on Easter in my little boat catching Browns before winter finally decided to show up. Be careful with any searay 330ecs in that price range. (97 and newer at least). Be sure to survey if u do find one! They r gorgeous! I love my 3100 tiara, if the other located near me was available first, it would have been mine. I have an 86 Wellcraft Coastal 2800. It makes great use of space between the cabin and the large back deck. It has bunk beds for the kids and a v berth for my wife and I. Mine isn't listed but I would entertain a serious offer. If you are still looking for a fishing/cruiser I have one that might be just the thing for you. It is a little above you price range but worth it. I am selling my 30ft.Penn Yan Rampaig. I bought it new in 2003 and it only has about 200 hours on it. Powered by twin 5.7L Volvos and stainless duo-props. It has a fully enclosed "Alaska" cabin with a four foot extension over the cockpit. Some features iinclude a bow thruster, Garmin GPS 2010C and Garmin 20 sounder, twin batteries for each engine and one dedicated to the thruster (all new in June 2015), all weep holes are water proofed, barrier coated hull and bottom painted last year, full aft camper canvass with windows and screens makes a large living area when cruising, two stainless rod holders in gunnels and two attached to the rails (more can be added), engine synchronizer which allows for efficient cruising and trolling, a galley package, refrigerator, ample storage and much more. It is pristine condition and would make an excellent platform for fishing, cruising and charter. I am asking $39,000. If interested call 845 797 7354 or email [email protected] for more particulars and photos. I have a 27' baha Cruisers hardtop on this site. Asking 29500. Mint condition. Check out the ad. Something like what you're looking for that can be found in your price range possibly even rigged is a 10 meter Trojan. Older boat but I believe that they're a different stringer design and solid fiberglass. I'm currently looking for a similar boat in the same area as far as price range. Older Tiaras and Trojans are about all that's out there maybe a 330 coastal if you can find one. About the cheapest you'll find a 330 Express Cruiser is 55 but they are a very nice boat I've fished quite a bit on one with a member on here. 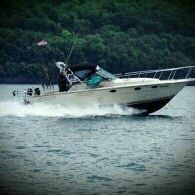 I have a Cruisers Yacht 32 for sale at Sodus Marina. It’s rigged for fishing and sleeps 6. $22,000 OBO. It’s posted on LOU if you are interested in the details. Has been a great boat, but we want something a little bigger. 2. I get lower gph on 2 small blocks than I did I one large block, no idea why. 3. The most important thing to look for when buying a boat is how much the previous owner loved it. 3 year old topic .I would bet the OP has a boat by now.